In the old times the biggest enemy of the Orthodox Church was heresis. Heretics used to maintain their theories upon religion and in order to fight Church, they used their spiritual weapons such as hymns. Hearing the music of “Infestissumam” reminded me of that movement from heretics. 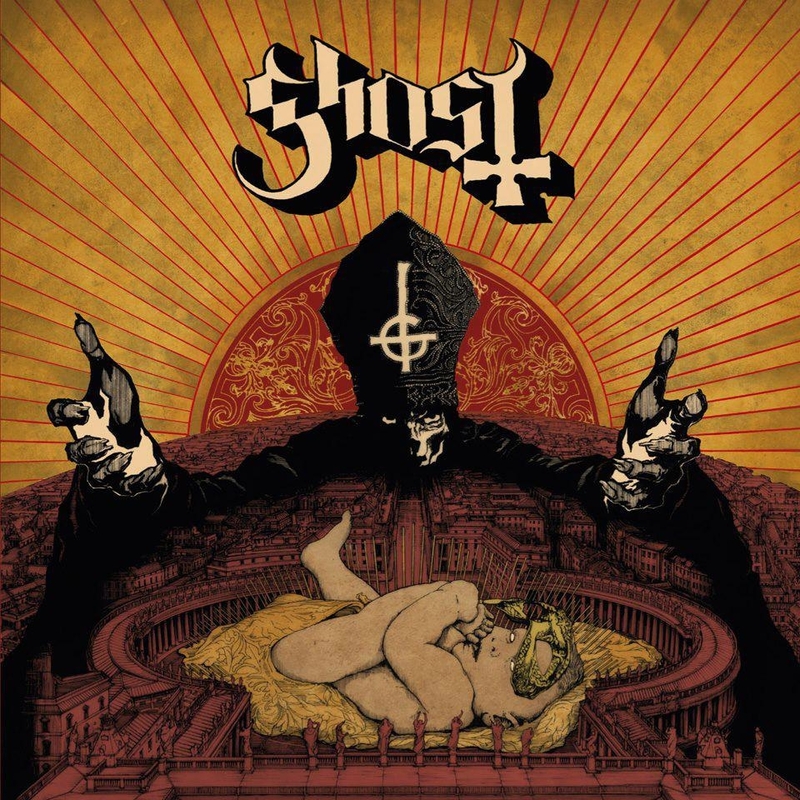 Ghost custom their music with elements of Catholic Church with the use of an organ and the polyphonic parts. If you were expecting a surprise album from the Sweden just like their debut “Opus Eponymous”, I guess you got it wrong like me. But this doesn’t mean that we cannot recognize it as a great album. It differs from the debut on the sound. It’s not as heavy as the previous, it’s based more on a light rock/pop sound of the past where we meet the gravity of Beatles with the happiness of ABBA and the rock attitude of BOC. They keep using Latin phrases or names as it is heard in two of the most addictive songs “Per Aspera, Ad Inferi” and “Year Zero”. It seems that Ghost will grow the art of progressing an idea into a song that varies from parts. Who could expect “Ghuleh/Zombie Queen” whose intro on piano brings in mind both the artistic side of Queen and the peaceful playing of John Lennon. Beautiful melodies that are being followed by eruptions. Of course there are and the heavy songs like “Secular Haze” and “Depth of Satan’s Eyes”, where guitars present their lead role. Known by millions as “Sister Mary” for her role in Queensryche’s platinum selling “Operation Mindcrime”, Pamela Moore’s “Resurrect Me” is a full length offering that combines the best elements of heavy metal music, both past and present. Featuring Jeff Loomis (Nevermore), Ralf Scheepers (Primal Fear), Brooke Lizotte (Jennifer Hudson, Leona Lewis) , and popular Chicago based metal guitarist Michael Posch, “Resurrect Me” brings an uncompromising wall of sound while showcasing Pamela’s three and a half octave range and melodic vocal arrangements. Four years in the making, “Resurrect Me” is a well-polished powerful 10 track album that stands on its own against anything in today’s metal marketplace! Official release date is set for Tuesday May 14th, 2013. AND RECIEVE A PERSONAL THANK YOU PHONE CALL FROM PAMELA! The common sense says “if you want to listen to Iced Earth, listen to their discography”. I don’t disagree with that statement, but we mustn’t forget the new bands which build their own discography on steps of older ones. 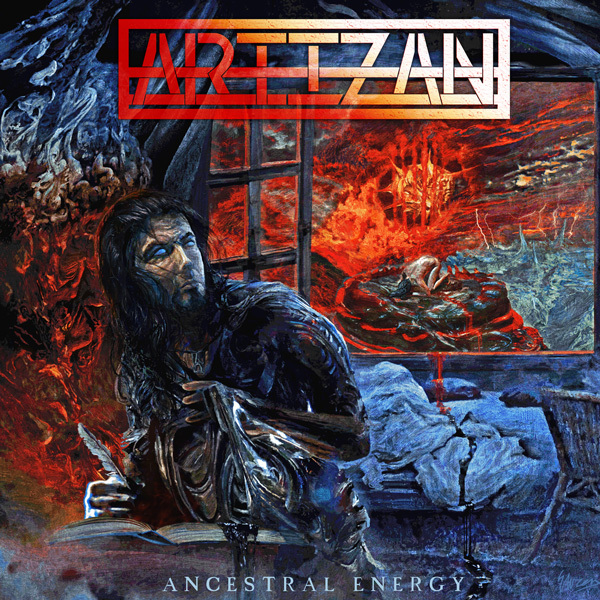 So, there is no problem with the fact that Artizan through “Ancestral Energy” have something from Iced Earth. Never forget “it’s not what you are playing, but how you do it”. The album is for those who want melodic lines and memorable songs. Certainly cannot make the difference as an album, but in the circle of those who enjoy themselves listening to simplicity, this will be a nice company. The opening song “I am the Storm” becomes the fan favorite from its chorus. It works like a poison arrow, it hits you in your heart and then try to catch yourself in a time without singing it. Tom Braden sings it ideally and the rest is history. What is happening with that song goes on with “Deep Ocean Dreams”. Excellent melody on its chorus and great rhythm sections. It’s clearly that the band really wants to move into melodic lines, something that comes out from the vibe of the most songs. Check “The Guardian” which is the most melodic and permitted to say experimental on a way that is far from the Iced Earth tone that captures the rest album. Also the production helps the melody to be in front of everything, but personally I would like the guitars to be heard more in tune, to be even more powerful. The same thing I would like to hear from Tom. He is a melodic singer, but I believe that his voice has the ability to be sound heavier. I’m not talking, of course for screams, which the safe solution for some singers. In the song “Ancestral Energy” we have a pleasant surprise where Tom shares the vocals with Matt Barlow and somehow we travel back in the good days. I really enjoy the ending of that song. Finally, the ideas are nice, but for me they need to become a little bit stronger and including some guitar solos as well, something that lacks in some songs, making them weak. Germany’s prog metal veterans IVANHOE are ready to return with a new album called “Systematrix”! The album was recorded at the Red Room Studios with producer Andy Horn (Lanfear, Edenbridge, Voices Of Destiny et al.). The band has now revealed the cover artwork, created by Thilo “Minz” Meyer, as well as a brand new song off the upcoming album! “Systematrix” will be released on May 24, 2013 via Massacre Records!